It has been over a year since the CDC made its initial announcement in March 2014 of an Ebola outbreak affecting the lives of those living in West Africa. During the first few months of the outbreak, the rate of cases increased at a shocking speed and health professionals in the areas were not well prepared to treat so many victims. Kind volunteers from all over the world selflessly gave their time to aid those who needed proper care, but a big problem still remained; there was a major shortage of supplies to give people the treatment they needed. We watched the news in shock as rates climbed quickly at devastating numbers with no end in sight. Ebola is an infectious and generally fatal disease marked by fever and severe internal bleeding, spread through contact with infected body fluids by a filovirus (Ebola virus), whose normal host species is unknown. Due to the continuous shortage of medical supplies and protective gear, we at DIG (Devon International Group) wanted to make a difference by donating to the communities in West Africa to aid in the treatment of the Ebola virus. We gathered our employees for two “Devon Cares” events to raise money; a bake sale and a cook-out, as well as a 50/50 raffle, which were all successful and we ended up raising funds to purchase 8 cases of gloves, 7 cases of gowns, and 8 cases of hand sanitizer, adding up to over 9,000 items. Devon Cares is DIG’s employee driven fundraising non-profit arm in which DIG’s employees help to raise funds for various causes. We are appreciative of the fact that DIG employees have always made an effort to make an impact, as we have seen with our efforts in aiding in relief for Ebola. We pushed our efforts of raising supplies out to the local community through our website and social channels. We received many visitors where those interested in contributing to the donation could easily access information, which lead to generous supply donations and interest from individuals, churches, and the boy scouts. The Healey International Relief Foundation (HIRF) is a public charity established to improve the life of the world’s most vulnerable people such as families and individuals affected by war and adverse socio-economic conditions. 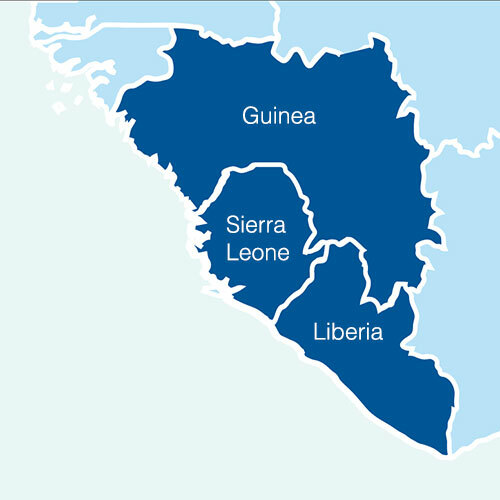 HIRF has continuously sent supplies to Sierra Leone to aid in relief efforts, and we were able to give supplies to the foundation that will make a difference in Africa. After several months of heavy reporting on media and news stations in America, it has substantially slowed the frequency of news on Ebola. Because of the decrease in coverage, you may not be aware that Ebola is still an issue in West Africa. As of April 9th, there are 25,567 total cases and 10,599 deaths due to the Ebola virus. In the week of March 29th, Ebola cases increased in Guinea but decreased in Sierra Leone. Although the numbers are not growing as rapidly as a year ago, Ebola is not gone. In one week’s time (April 2nd to April 9th) there were over 100 deaths added to the Ebola death count. Current news about Ebola mostly features ways to contain future outbreaks, what we have learned from this outbreak, and Ebola virus vaccines, and for the most part doesn’t discuss much of what is still happening in West Africa. The truth is that Ebola is still an issue in many parts of West Africa and they still need help. Ebola is only spread through a person who is already showing symptoms. No dogs or cats have been reported with Ebola. Foods imported from Africa are safe to consume. Ebola is killed with household bleach and other disinfectants. You cannot contract Ebola through skin contact.